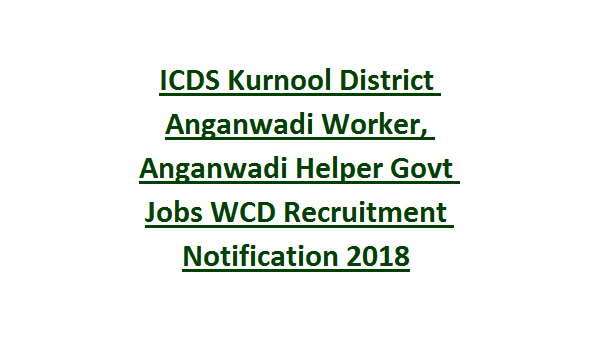 vacancies are for the 16 ICDS projects which are running under Kurnool WCD. Interested married female candidates who are residing in the same village they are only eligible for applying this WCD kurnool Anganwadi Helper or Anganwadi Worker jobs. Candidates must have submit their applications forms along with necessary documents of self attested to respective CDPO office before the closing date of 26-11-2018. Details vacancy details, qualifications, and other details are given below for this Anganwadi Helper, anganwadi worker jobs. 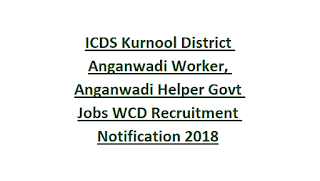 There are total 248 Anganwadi Worker and Helper jobs in this ICDS Kurnool District recruitment 2018. For all the posts 10th passed candidates are only eligible to apply. Candidates must be married preference will be given Widow or divorced candidates. As on 01-07-2018 candidates age limits are 21-35 years. Candidates selection will be based on merit in qualification and reservation based. Widow candidates and divorced candidates are preferred for this ICDS Kurnool vacancies.